Louise Young. 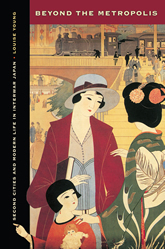 Beyond the Metropolis: Second Cities and Modern Life in Interwar Japan. University of California Press, 2013. In Beyond the Metropolis, Louise Young looks at the emergence of urbanism in the interwar period, a global moment when the material and ideological structures that constitute “the city” took their characteristic modern shape. In Japan, as elsewhere, cities became the staging ground for wide ranging social, cultural, economic, and political transformations. The rise of social problems, the formation of a consumer marketplace, the proliferation of streetcars and streetcar suburbs, and the cascade of investments in urban development reinvented the city as both socio-spatial form and set of ideas. Young tells this story through the optic of the provincial city, examining four second-tier cities: Sapporo, Kanazawa, Niigata, and Okayama. As prefectural capitals, these cities constituted centers of their respective regions. All four grew at an enormous rate in the interwar decades, much as the metropolitan giants did. In spite of their commonalities, local conditions meant that policies of national development and the vagaries of the business cycle affected individual cities in diverse ways. As their differences reveal, there is no single master narrative of twentieth century modernization. By engaging urban culture beyond the metropolis, this study shows that Japanese modernity was not made in Tokyo and exported to the provinces, but rather co-constituted through the circulation and exchange of people and ideas throughout the country and beyond.